Pure Chat is a combination of two useful software. 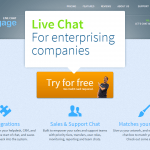 They offer a free live chat software and an ArtiBot.ai which is a free lead capture bot. However, the live chat software is only free for three operators. PureChat is aimed towards websites that have high traffic and need to provide support or presale chat for the viewers. It comes with many features including a powerful operator dashboard, unlimited chats, native Android and iOS apps and up to 3 operators for free. ArtiBot.ai, on the other hand, is beneficial for websites that are service oriented. It can be used to collect leads and help you automate a response system. ArtiBot.ai can run 24/7 without any interruptions. It also lets you capture leads. Moreover, it is easy to install and setup. Any business can use Pure Chat solutions. Their ArtiBoit.ai is completely free whereas the Pure Chat free live software comes with limited functionality. You can connect with them through their live chat software. 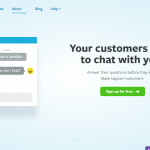 If live chat is not available, you can connect with them through email. Pro: $79/mo., everything that the Free plan offers plus unlimited users, visitor tracking, real-time analytics, and much more.